If reusing the clips, do not remove the double-sided tape remaining on the clips and where the clips will be installed on the body. If installing new clips, remove the double-sided tape remaining where the clips will be installed on the body and clean the body with a non-residue solvent. (a) Apply a 2 to 3 mm (0.0787 to 0.118 in.) 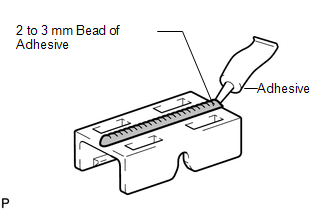 bead of adhesive (3M DP-105 or equivalent) to new roof drip side finish moulding clips. 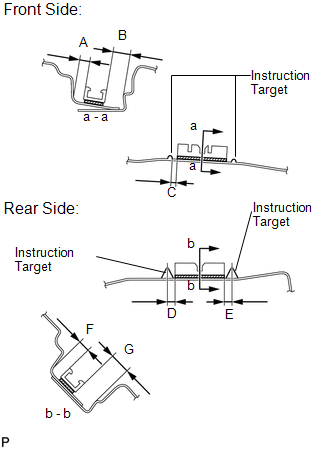 (b) Press and install the 2 roof drip side finish moulding clips. 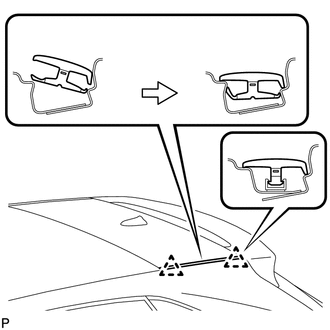 (c) Install the clips to the positions on the roof panel shown in the illustration. 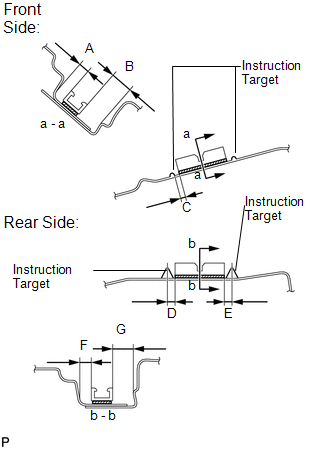 Determine the locations and firmly press and install the 2 roof drip side finish moulding clips after lightly applying adhesive (3M DP-105 or equivalent). (d) Install the roof drip center side finish moulding when 20 minutes or more have elapsed after pressing and installing the 2 roof drip side finish moulding clips. 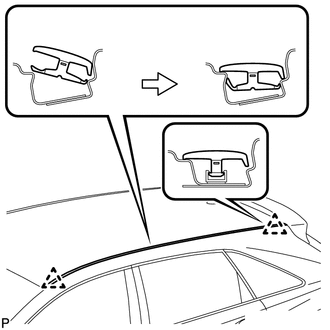 (a) Engage the 2 clips and install the roof drip center side finish moulding as shown in the illustration.